This evening I attended the 27th Annual Toronto Planning Dinner. 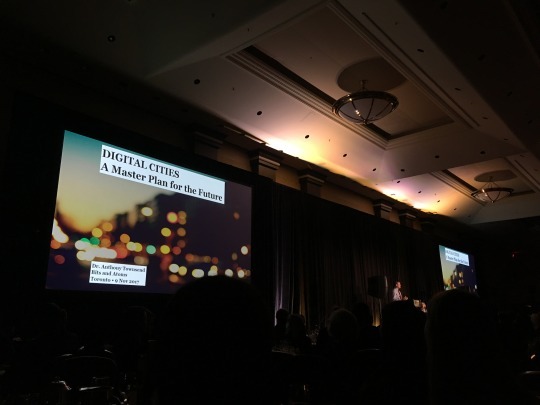 It’s an annual dinner for people in planning and development, put on by the University of Waterloo Planning Alumni of Toronto. Thank you Wood Bull LLP for the invite. The keynote speaker was Dr. Anthony Townsend. He is the author of SMART CITIES: Big Data, Civic Hackers, and the Quest for a New Utopia. I haven’t read it (yet), but his talk offered a preview of it and I think it would be of interest to all of you. It deals with many of the topics that we discuss on this blog, one of which is the interrelationship between our physical environment and the networks and software layers that we are now building on top of it. These layers have the potential to augment and enhance our cities (maybe make them smarter), but they also have the potential to do us harm. One important issue that Townsend brought up is that of privacy. Cities used to enable anonymity. When essayist and art critic Charles Baudelaire wrote about “modernity” in 19th century industrializing Paris, it referred to an ephemeral and fleeting kind of urban environment. Pass someone on the street and you may never see them again. That must have felt sad at the time. Today we live in a fish bowl. Will the city of the future endeavour to do the same as we equip it with more “smarts”? I guess that’s why Townsend believes that privacy will define a big part of 21st century urbanism. There’s no doubt that it will be very important.